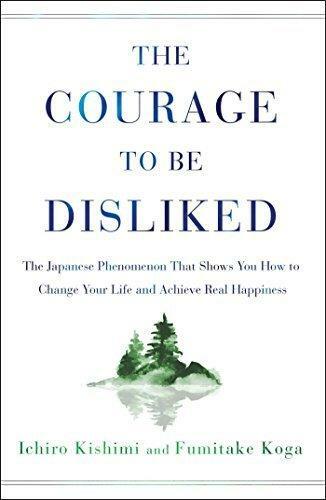 I recently finished listening to the book, The Courage To Be Disliked. I was skeptical at first because it is marketed as a "Japanese phenomenon" and that didn't line up with my 18 months of experience living in Japan. This country is immersed in a culture of shame, every other word is an apology, beauty ads bombard you at every turn and every effort is made not to inconvenience another person. It didn't add up to me. Of course, I am no expert in this culture, I barely speak Japanese and my friends that are Japanese are kind of westernized, so trust me when I say, I am Jon Snow and I know nothing. Having just finished the book hours ago it is too early for me to claim that it changed my life (but I'm leaning hard that way). I read a lot of books about the science of happiness and wellness and for the most part I am usually excited about the ideas proposed and many times I have implemented some of the suggestions. This time, however, it was like the authors were speaking to me personally. They knew about my inferiority complex, my constant concern about what others think, believing that I will one day find my true purpose in life and blow the socks off everyone. TL;DR my thinking is complete nonsense and I need to stop it immediately. This is especially true because the philosopher that they based this book on, Alfred Adler, says that it takes half of your current lifetime to put his teachings into practice which means I'll be close to dead when I have this all in working order. I have bought into Adler's entire philosophy, I'm ready to join his congregation, but for the purpose of this post and because I don't want to drone on like I'm an expert, I'm focusing on one important nugget -- the idea that it's OK to be normal. To not be special. I'm not going to change the world and that's OK. When I heard this, I literally felt like a weight had been lifted off my shoulders. I'm no longer competing with imaginary foes, I'm not hating myself for not getting on the cover of a magazine for doing something extraordinary. I'm just me. Normal me. And there's at least a few people in my life that are happy that I am. We’re brought up to think that we’re special, and we like believing it. But I don’t say any of this as a cynic or to depress you. In fact, quite the opposite. I say it because distinguishing between our subjective perception and the objective reality is the key to living a meaningful and important life. Acknowledging unimportance liberates us from the grips of the self-centered voice in our head that’s chiefly responsible for many of life’s difficulties. It’s the voice that compares us to people that don’t matter, it’s the same voice that convinces us that we’re entitled to a comfortable and easy life, and it’s indeed this voice that has us chasing arbitrary measures of success. We spend our time acquiring things we don’t want or need, we falter at the first sign of hardship and inconvenience, and one day, we wake up to a ticking clock realizing that, all this time, we’ve lived somebody else’s life. The surest way to be unfilled is to walk around like you hold some sort of a privileged position in the universe. It’s not only a completely false and harmful illusion, but it also overlooks the fringe benefits of being a nobody. Thanks for reading through a normal post by a normal run of the mill person.